Have you heard about the Simply Straight brush? Wonder whether to give it a try or not? Look no further! In this Simply Straight brush review, I’m going to tell you about my experience with this tool so you can decide whether it’s worth it or not. To give you the full picture, my Simply Straight ceramic brush review is based not only on my own experience but also on other users’ opinions. Of course, I’ve read like a dozen reviews before purchasing it. I guess reading reviews is something like a common practice these days, isn’t it? Anyway, from this Simply Straight ceramic brush review, you will find out everything you want to know about this tool – from its appearance to the features. I understand that for some people, the design matters as much as the functions. Also, we’re going to compare the tool with five other straightening brushes. So, if you’re choosing one right now, I hope my Simply Straight brush review will help you make up your mind. I won’t spoil anything right now, so arm yourself with patience, and let’s get started! 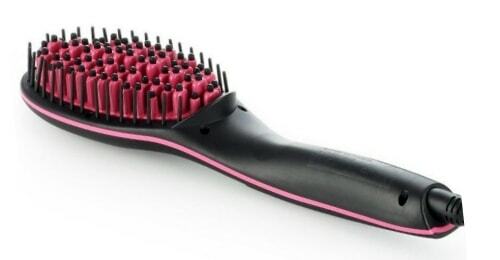 This appliance comes in black and pink, the whole body and the handle of the brush being black, and the bristles being pink. I’m not sure whether such a color scheme is the best option since it looks a little girly. Anyway, I believe that the brush design shouldn’t rank first, and its features are way more important. At least, the brush looks sleek and neat. Isn’t that enough? The controls are placed on the side of the handle. There are the on/off button and two buttons for adjusting the temperature. The current heat is shown on the LCD screen which is also located on the handle, to be more precise, on its outer side. When straightening, you may involuntary push the buttons, changing the temperature or even turning the tool off. It may take some time to get used to such placement. The brush features ceramic-coated bristles. They’re legit hard, they don’t bend or something like that. The lateral teeth may twist a bit after using the brush, and a couple of the bristles’ tips may fall off. At least, this happened in my case. But in general, this doesn’t make straightening any worse, so it’s just a minor con. Just be aware of burns since the bristles get rather hot. There is quite a long swivel cord, something about 6 ft. According to the manufacturer, the shipping weight is 1.4 pounds. For me, it’s pretty heavy, but I get that it’s not a simple brush and there is some electronic magic in here. 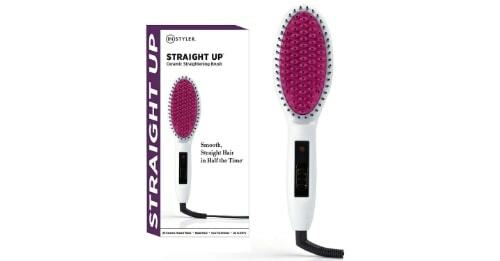 As you probably know, the hair straightening brush is a great alternative to the flat iron. It’s just as good at straightening your hair. It’s easier and faster to use. 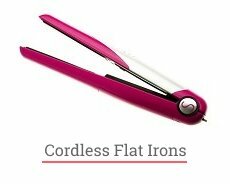 Plus, the straightening brush doesn’t make your hair look flat as it sometimes happens with the flat iron (seems like the name is no accident). What I like the most about straightening brushes is their ability to keep or even add volume to your locks. The same holds true for the Simply Straight brush. It’s designed to reduce the damage caused by heat; it’s easy to use and convenient. 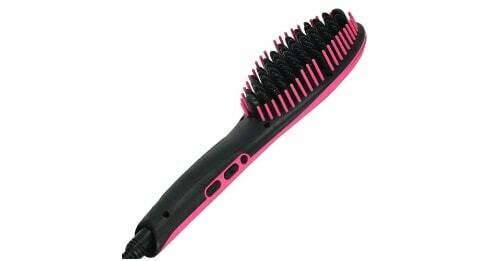 The brush features the bristles coated with ceramic which provides even heat distribution. By the way, the ceramic coating is considered to be a rather healthy solution for your hair condition, so it’s quite a benefit. There are 3 heat settings, and the maximum heat level is 450°F. This means that the tool should work well for all hair types, including thick and coarse locks. But if your hair is thin, damaged or brittle, you should straighten it on lower temperatures. There is an instruction guide coming with the brush, and it says precisely what temperature level you need depending on your hair type. Read the guide and follow the instructions carefully. When using any electrical appliance, always observe the safety procedures. Never apply a straightening brush on wet or damp hair. It must be absolutely dry. Also, don’t forget to use a heat protector before straightening. And always unplug the brush when it’s not in use. I’ve used a couple of hair straightening brushes before, so I know what to expect from such a tool. In a nutshell, I find this brush to be a decent appliance that gets the job done. There are some flaws, but I guess they’re inevitable, right? I have to admit, this brush takes a while to heat up. Many other straightening brushes that I’ve used took less than a minute to get hot. And with this tool, you have to wait more than a minute. For me, that is not a solid con but if you lack patience – maybe this brush is not for you. On the bright side, the whole straightening process took me something about 15 minutes. My hair is medium-length, so this wasn’t exhausting. I guess girls with thick or long hair will need much more time to make it straight. Plus, this brush works great on thin hair. And I’ve read a couple of Simply Straight brush reviews where people said that it wasn’t that good at straightening really thick locks. And if your hair is very curly, the brush may leave a slight wave. So, you may need a flat iron afterward to make it perfectly straight and finish up your look. Finally, I wouldn’t recommend it for straightening short hair. Due to its oval shape, it’s hard to get to the very roots so there may be some kinks. Make sure to hold the brush so that the bristles don’t touch your scalp and skin. It’s not a regular brush, and the techniques aren’t the same. The brush gets pretty hot, especially the body and the bristles. Do not touch them, otherwise, you may get burned. The bristles are tight and sturdy, so they may pull out some hair. Comb your locks thoroughly, so that there aren’t any tangles. This helps save as much hair as possible. Despite all these weaknesses, I’m satisfied with this brush. Instead of thin wavy locks, I’ve got shiny and smooth sleek straight hair. I was expecting it to get straight, but shine and softness was a great surprise for me. So, I would recommend you to give this brush a try, especially if you have thin or normal hair that is not too long, and have a tight budget. Just like any other styling tool, the Simply Straight brush has its strengths and weaknesses. Let’s make it loud and clear. Here, I’d like to compare the Simply Straight brush with some other straightening brushes. Let’s start with the Head Kandy Brush 2.0. 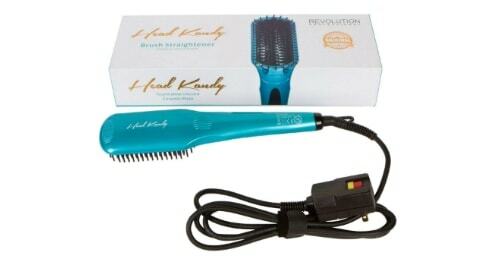 Just like the Simply Straight brush, the Head Kandy straightening brush doesn’t work well on curly thick hair. On the other hand, the latter features the dual voltage, but you still need an EU plug adapter. All in all, the Head Kandy brush seems to be a little better since it warms up really fast. However, there is a day and night difference in price. The Simply Straight brush is almost 4 times cheaper than the Head Kandy one. Both brushes have the similar oval shape so they don’t work for short hair. Both of them are easy to use and attractive in terms of design. As you can see, the Instyler brush seems to excel for all intents and purposes. Currently, on Amazon, the Simply Straight brush is half the price of the Instyler one, but I guess the latter is worth it. Personally, I would prefer the Instyler straightening brush. Both brushes are pretty easy to operate, and the features are quite similar. For me, the Sutra hair straightener is a bit better since it’s dual-voltage, and it features ionic technology. On the other hand, the Simply Straight brush is cheaper. I hope the full review of the Sutra hair straightener will help you decide which one is better. In this case, the price is almost the same. 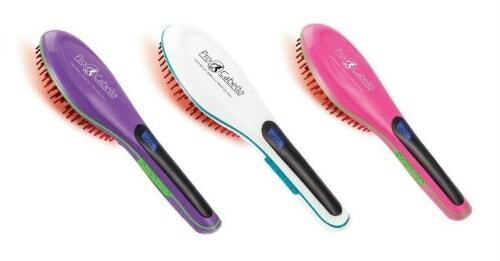 I consider the Procabello brush to be a little better since it heats up faster, features dual voltage, and employs the infrared technology. Plus, the bristles’ tips are designed to protect your skin and scalp from burning. Due to their oval shape, both these brushes don’t work on short hair. 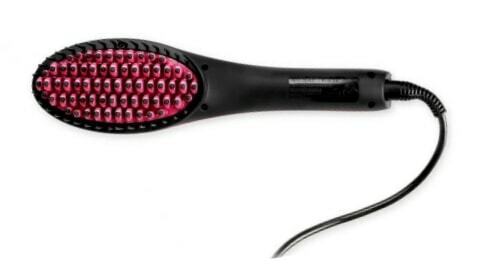 Find out more about the Procabello straightening brush. Both these brushes are oval-shaped, so they won’t work on short hair. The Luma straightening brush doesn’t have a display to show the current temperature which is quite a flaw. On the other hand, it features anti-scald design and dual-voltage, but you may still need a plug adapter. 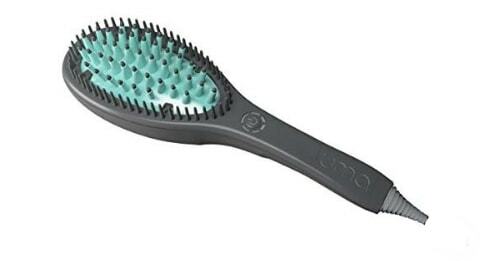 What’s more, the Luma brush has a sleep mode and even a failure mode in case of a system error. As a person who cares about safety a lot, I really appreciate these features. For me, the Luma brush beats its rival, but the price isn’t that attractive. The Simply Straight brush is way cheaper, and this may be a key factor for some people. As you can see, the Simply Straight brush has its pros and cons. For me, it’s a decent straightening brush, considering the price. 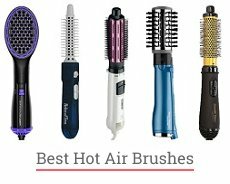 On the other hand, you can easily find an affordable brush of the higher quality – something like the Sutra hair straightener or the Instyler straightening brush. The brush features nice design, adjustable temperature settings, and ceramic-coated bristles. At the same time, it takes a while to heat up, doesn’t work on short hair, and may pull out some locks. Finding the right straightening brush for short hair is quite a challenge but most modern brushes tend to warm up in a matter of seconds. So, this can’t go unnoticed. As far as I know, there are several editions, so to speak, of the same brush. You may find some other variants on the market, and their features may vary to some extent. Generally, the brush does the trick. It takes 10-15 minutes to straighten my hair, and it leaves them soft and shiny. I really like the result since I had low expectations before trialing it. That’s my secret to get pleasantly surprised by whatever I try, be it a new straightening brush or a new laptop. I hope my Simply Straight ceramic brush review was at least a bit helpful. Like I said, that is a decent straightening brush that gets the job done. The price is attractive, and there is no such thing as a flawless styling tool. So, if you’re looking for a new straightening brush on a budget, you may want to give it a try. Good revision, but I prefer my Karmin smoothing brush.